A guided study through the Bible, Genesis to Revelation, in nearly 150 lessons. Ideal for individual or group Bible study. Explore the Book covers the entire Bible –- Genesis to Revelation –- in nearly 150 lessons. The lessons are perfect for individual studies, or they can be easily used in small groups or Sunday school. More than a reference work, Explore the Book is a guide to your studies. Baxter's approach provides a solid "grounding in the Scriptures" as he examines each Bible book. 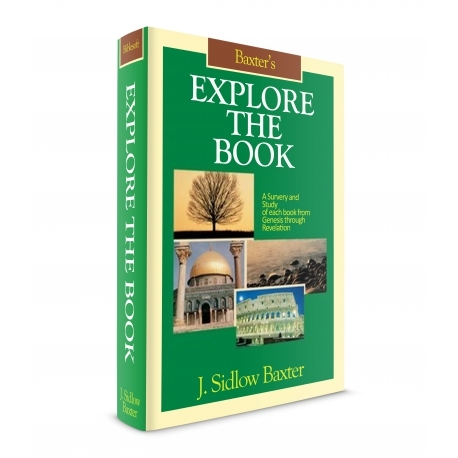 Beginning with Genesis, Baxter explores the essential message of each book of the Bible, setting forth its structure with careful, yet easy-to-understand analysis. He shows the reader the main themes as they are revealed and provides suggestions for further study. Every lesson encourages the reader to read the Bible passage to be studied first, then proceed to the lesson. You'll come away from each lesson with a firm understanding of the truths presented and a greater love for the study of Scripture. Whether you're looking for direction in your personal studies, or desiring to share a comprehensive overview of the Bible with others, this six-volume collection of study lessons will work for you.